Da-Da-Da-Daah! It’s one of the most famous themes in classical music, from one of the most famous of all symphonies, written by one of the most famous composers. It is also, now, the perfect way to introduce a young child to the world of classical music. This charming and interactive picture book with sound panel is like a ticket to a concert hall. 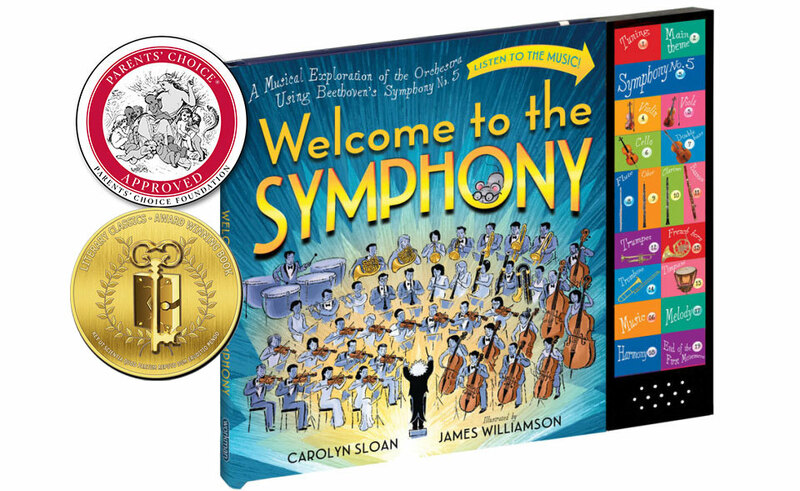 Narrated by three mice, Welcome to the Symphony takes readers on a journey that begins with the musicians tuning up. Readers learn the basics: What is a conductor? What is a symphony? Who was Beethoven? The elements of music: melody, harmony, tempo. The families of instruments— strings, woodwinds, brass, and percussion. But the best part is that every idea is illustrated in sound. Nineteen sound buttons allow readers to actually hear the different parts and voices of the music—the famous beginning of the Fifth, what a clarinet sounds like, what a melody is, and what harmony is. Kids will want to match their voices to the A note that the concertmaster plays to tune the orchestra, dance to the full-throated passages—and, of course, sing along to da-da-da-daah! The Met Opera Store, etc.